Solar energy is a global issue and many countries are now under obligation to produce a certain proportion of their electricity by clean and renewable means. This shift away from a dependence on fossil fuels is being driven by concerns about sustainability, global warming and pollution. Developed countries are leading the way and in 2009 the U.S. Senate Committee on Energy & Natural Resources called for 3% of U.S. electrical generation to come from non-hydro renewables by 2011-2013, with up to 15% further into the future. Given that more energy hits the Earth’s surface in one hour than the whole world uses each year (approximately 15 TW), it is clearly advantageous to exploit this method of electricity generation. Indeed, photovoltaic (PV) production is a billion dollar industry that is set to become truly mainstream when the cost is comparable with other energy sources: at the moment it is about four times too expensive. Cost is expressed in $/Wp, i.e. the cost of the solar cell divided by the peak amount of power generated. A PV device, or solar cell, is an electrical device that converts light energy into electricity by means of the photovoltaic effect: when photons from a light source are absorbed by semiconducting material, electrons are knocked loose from their atoms and are able to flow freely through the material. Arrays of conductive tracks on the cell collect these electrons and transfer an electrical current to an external circuit. 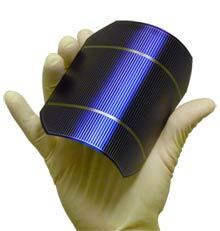 There are three generations of solar cell technologies, based on the type of materials used. The first generation, based on crystalline semiconductors, accounts for nearly 90% of the cells produced. Based on silicon wafers and achieving 20% efficiency or more, they are too expensive to be a viable solution for the mass market. Instead of wafers, second generation technology, which uses the deposition of thin films of semiconductor onto low-cost substrates, is beginning to expand its market share. Still in development is the third generation, based on organic light absorbing materials rather than the inorganic materials used in the first two generations. PV is the fastest growing energy technology, growing a hundredfold in the last decade and the EPIA/Greenpeace Advanced Scenario predicts that solar energy could be generating 1.8 TW of electricity worldwide by 2030, which would satisfy the electricity needs of almost 14% of the world’s population. In order for PV to become a viable solution for mass adoption, both the cost of the raw materials and the manufacturing process must decrease, as currently government investment in the form of subsidies is being used to encourage adoption – a situation that is not sustainable in the long term. One way of achieving a reduction in manufacturing costs is to use inkjet printing for the controlled deposition of functional materials onto a substrate. Existing coating techniques either use vacuum deposition, which becomes increasingly expensive at large areas, or techniques like spin or spray coating. All non-printing deposition techniques rely on patterning the material by deposition in a complete film and then removal of the material where it is not required – so-called subtractive processing which is very wasteful of materials and requires two steps. In contrast, printing techniques deposit the material where needed in a single step, providing potential benefits in production costs from fewer process steps and reduced materials wastage. A strong candidate technology is inkjet printing, with other technologies such as screen and flexographic printing also being considered. The precise nature of drop-on-demand inkjet printing lends itself to depositing thin films at a constant thickness and accurately printing the required patterns of solar absorbing materials, as well as conductive material such as silver. Inkjet printing allows relatively fine features (currently around 30 µm) to be defined compared with screen printing, reducing material costs and increasing collection efficiency, as the thinner lines cover less of the area of the cell that is used to collect photons. A key advantage of inkjet printing is that it is a non-contact process, which allows multiple layers to be built up without the risk of damaging previous layers, and also allows the use of very thin and flexible substrates. Flexible substrates, including fabrics, can be processed continuously on a reel-to-reel production line to drive manufacturing costs down further, as continuous printing allows much higher throughputs in terms of amount of solar cell area produced per hour. The printing of low-cost solar cells onto a variety of materials, including fabrics, gives the promise of readily available solar power in the future across a broad range of applications and in unexpected places, such as clothing, tents and awnings or even synthetic grass. The availability of low cost solar power combined with a variety of materials and products provides solutions for lighting outdoor areas, generating power from previously unused areas (such as highway run-off areas) and providing power to areas that are inaccessible by an electrical power network, such as for camping and in developing countries. Given these benefits, it is not surprising that inkjet technology in solar cell manufacture is now being deployed commercially. Several companies now use inkjet technology in the production process for second generation thin film solar cells, and numerous groups are exploring the possibilities for third generation cell production. The key issue with organic devices is that, while the promise of very low cost production is real, the lifetime of the cells needs to be improved significantly before third generation technology is ready for prime time. Lifetimes of up to 30 years are required for commercial solar cells, and prototype third generation cells show excessive degradation from UV exposure. With focussed development effort, it seems likely that these issues will be resolved over the next few years, allowing the promise of cheap, readily available solar power to be delivered.